CONVERT YOUR USED OIL TO PROFIT! Send your contact data to: for a dvd video showing our products and systems. Be sure to include your: Name, Business Name, physical address and phone numbers. We will mail the video out promptly. 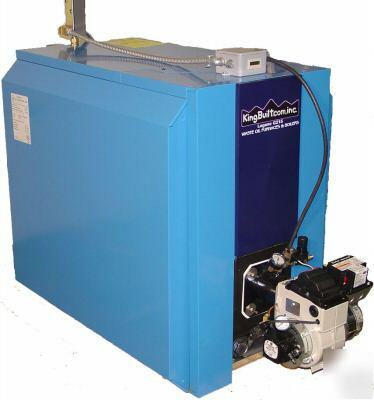 This is a new waste/multi-oil boiler system manufactured by KingBuilt.com, Inc. model KBB-200. The maximum btu input is 200,000 btu with an output of 175,000 btu. 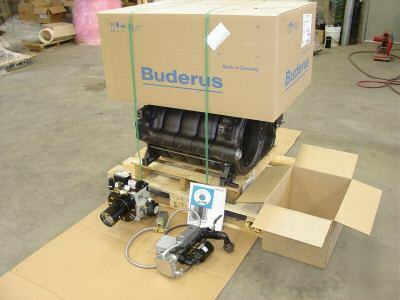 This system will burn used multi-weight crankcase, ATF, gear lube, Veggy, etc. 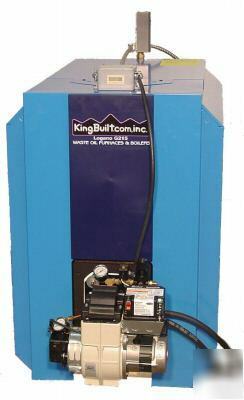 This system features KingBuilt.com, Inc.'s HPC-1 waste oil combustion system which does not consume any electricity to preheat oil. This combustion system NEVER needs to be overhauled unlike electrically preheated waste oil combustion systems which use electric heaters to preheat oil. 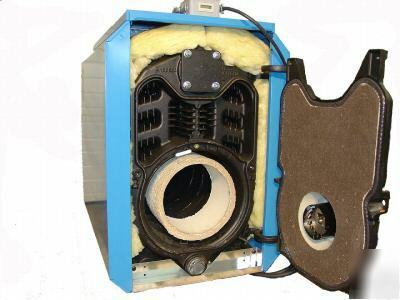 We provide a full 10 year warranty on the boiler vessel and 2 years parts on the combustion system and full factory technical support.